“Glamping”, or glamorous camping as it’s known to the uninitiated, is a new travel trend sweeping the world. It evolved from the eco-tourism movement, which encourages modern travellers to become more conscious of their environmental footprint. Glamping allows travellers to get back to nature while enjoying all the creature comforts of a hotel. Guests avoid the hassles of traditional camping – like putting up a tent or sleeping on the ground – by staying in readymade (and luxurious) tents, huts and cabins. One of the original glamping facilities can be found on the edge of the Forest of Dean in Gloucestershire, UK. 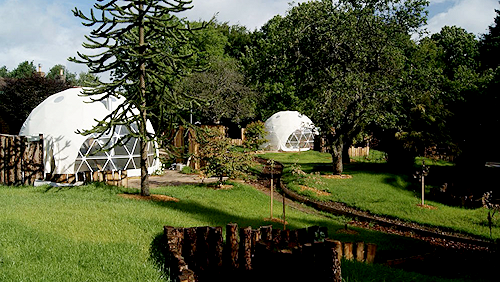 The Dome Garden is a village of dome-shaped tents that use innovative insulation techniques to keep occupants warm. They can easily fit a family of six. Though the domes are fully outfitted with ensuites (a glamping necessity!) the Dome Garden as a whole is really glamping at its most basic – particularly in comparison to what we’ve got coming up! 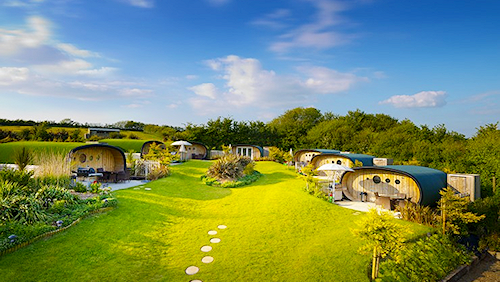 Atlantic Surf Pods is a resort set close to the beaches of North Cornwall in the UK. Its eco-pod cabins are surrounded by scenic farmland, while communal barbeque and dining facilities harken back to traditional camping practices. However, guests are spared the joys of communal shower blocks. Each pod is equipped with a private modern bathroom. The highly insulated cabins also enjoy cushy underfloor heating – because why should you be cold like the plebs who camp the old-fashioned way? Prices range from £45.00 to £85.00 (AU$76 to $143.60) per night per pod. 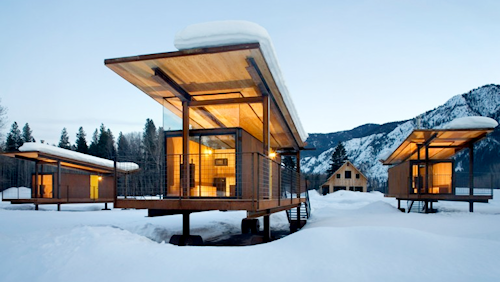 These minimalist rolling huts in Washington’s Methow Valley include basic living facilities – there are no ultra-plush mattresses here. However, they do let you escape the cold and snow with a kitchen, fireplace and lounge room. They are also surprisingly spacious, especially when compared to standard hiking huts. The real beauty in their design is that they’re built on wheels! The huts are essentially giant wheelbarrows that can be moved around the park to capture the ideal aspect for visitors. So if you’re looking for some privacy from a hut of rowdy neighbours, you shouldn’t have a problem! This glamping village was designed to resemble the accommodation used by northern Finland’s indigenous population, the Sami – though with a modern twist. 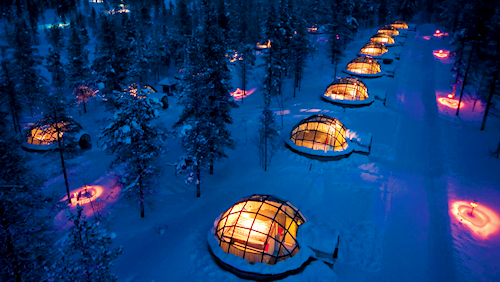 The igloo-like structures contain glass ceilings, which makes viewing the spectacular Northern Lights more enjoyable, particularly when the temperature outside drops below -30 degrees Celsius. Instead of staying in a hut made of ice, the Igloo Village has been made with thermal glass to prevent frosting, so the incredible views are consistent. This may be a bit of an inconvenience during the summer, when the Midnight Sun doesn’t set at all. These pre-fabricated structures (known as PODhouses) are an alternative to igloos when camping in the snow. They are constructed to withstand the brutal winter weather using FSC certified wood. The Swiss design firm behind the concept, ROB GmbH (Robust Outdoor Brands), builds the structures on order for clients around the world. Some owners chose to use them as a backyard home office or hideaway, though the cost of a basic model (without a solar panel) will set you back at least US$10,830 (AU$11,449). 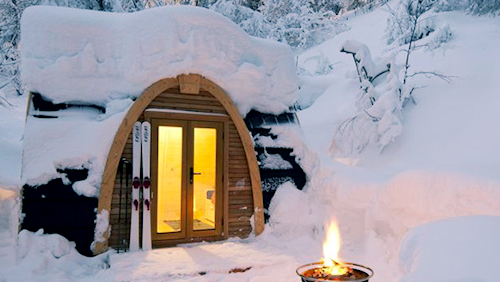 The PODhotel in the Swiss Alps (where else?) uses these pods as an accommodation option, offering guests a variety of two and three bedroom pods with electricity, lighting and heating (unfortunately there are no plumbing facilities). A stay at the PODhotel is AU$64.50 per night. The most exclusive glamping option we could find is located in New Zealand. Minaret Station typifies the glamping experience. Tents are referred to as “canvas suites” that contain wall-to-wall sheepskin interiors, balconies with private hot tubs and sweeping, uninterrupted views. If these luxury tents prove to be “roughing it” too much for residents, the guest lodge is just up the hill. It features a first-class chef at your service and an extensive library. Accommodation at this glamorous resort will make a decent dent in your savings. The first night is NZ$3,500 (AU$3067.45) while any additional nights will set you back NZ$1,950(AU$1,709) per night. 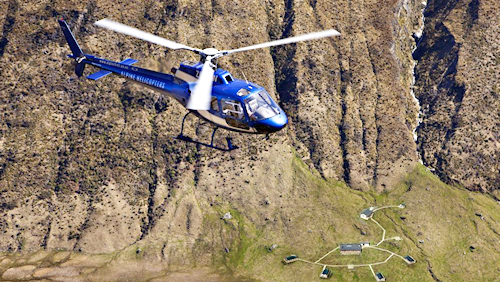 These prices include a full gourmet menu for every meal, as well as transport to Minaret Station, which is only accessible by helicopter. Living Green > What the Heck is Glamping and Where Can You Do It?